...through the bathroom window! Although I'd like to think otherwise, that she just needs a breath of fresh air... Maybe I'm right. She 'meowed' several times while she was up there, turning back and forth. 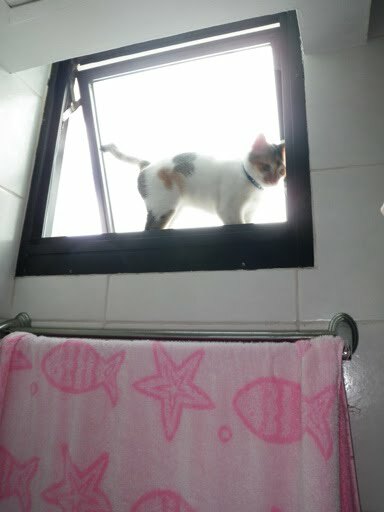 I didn't see how she 'flew' up to that window, possibly climbing through my pink bath towel! Wow, she can now climb like a monkey! I was so scared that she'd jump out from that window, I immediately went to bring her down after this shot.